It’s Halloween in Cleveland. Five children stand expectantly at a door, dressed as their respective heroes. Superman, Batman, Robin, and the Golden Age Green Lantern hold out their bags. Next to them, an angry kid sulks, knowing what’s coming. He has no hero. He’s Harvey Pekar, a kid from the neighborhood. 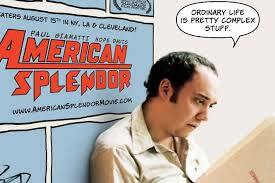 And as American Splendor, based on Pekar’s autobiographical comic book, opens, the sulking boy (Daniel Tay) gives way to the grumbling man (Paul Giamatti). Over his grumbling comes a louder, more gravelly voice. It’s Pekar himself, telling his own stories as he always has. Soon the camera shifts to reveal the real man providing voice-over, adding layer upon layer as co-writers and directors Shari Springer Berman and Robert Pulcini try to determine just what makes a man’s life tick. Combining interview techniques with straightforward storytelling, American Splendor covers the major points in Pekar’s life and career in a unique way. By major, let us not forget that this idiosyncratic writer has always reveled in the ordinary, and the film reflects that. Yet somehow it proves his own belief: that there’s heroism in living day to day. Because Pekar has always had different illustrators bring his stories to life, the dual presence of actor and subject works surprisingly well. Though Giamatti bears superficial resemblance to Pekar, he has created a character very much like the writer. If you have to, simply believe that the old man narrating really is the result of having finally learned to just take things in stride (though, really, he probably hasn’t). The film extends respect to the ancillary characters in Pekar’s life, too. Nowhere is this more obvious than in Judah Friedlander’s portrayal of Pekar’s co-worker Toby. A high-functioning autistic man, Toby is easily fixated on minutiae (welcome to the world of the fanboy). In one brilliant scene, Pekar gets into a discussion about jelly beans with Toby, then the camera pulls back as the actors finish, revealing the real Pekar and Toby watching. The two then continue the discussion, as the actors sneak behind them to observe. Usually recreations of such instances have a forced feel, so why bother? Backstage at Late Night With David Letterman, we see Giamatti wait nervously, then the film smoothly cuts to the actual interview segment. Only the infamous meltdown which resulted in Pekar’s banishment from the show gets a re-enactment, mostly, according to Pekar, so that you can actually hear what was said. I’ve been unfair. In many ways, this isn’t just Pekar’s story; it’s also that of his wife, Joyce Brabner. Hope Davis plays her, in a performance that could have easily been unpleasant. Instead, there’s warmth to her that makes you believe their marriage, unconventional as their courtship may be. Davis pulls out steel when necessary, and like Giamatti, makes you not care that you see the real Brabner. In fact, you might prefer the cinematic versions. The film does offer that choice – Berman and Pulcini even throw in occasional animated visions of Pekar from his comics. At one point, there’s also a moment from a stage adaptation, featuring Donal Logue and Molly Shannon as Pekar and Brabner. Perhaps that scene is colored by Pekar’s own opinion, because that version of the couple feels the least real. The film has a strangely pat ending. It’s possible that after spending so much time with Pekar and his alter egos, the filmmakers paid short shrift to the most recent years. Thankfully, it doesn’t come across as unbelievable; for me, the only false moment is at the beginning. I can’t believe that a housewife would recognize the Golden Age Green Lantern, even in the late ‘forties. 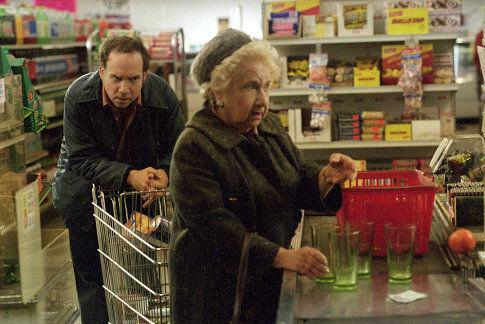 Still, American Splendor is quietly exhilarating. If most men lead lives of quiet desperation, Harvey Pekar proves they don’t have to do it lying down.